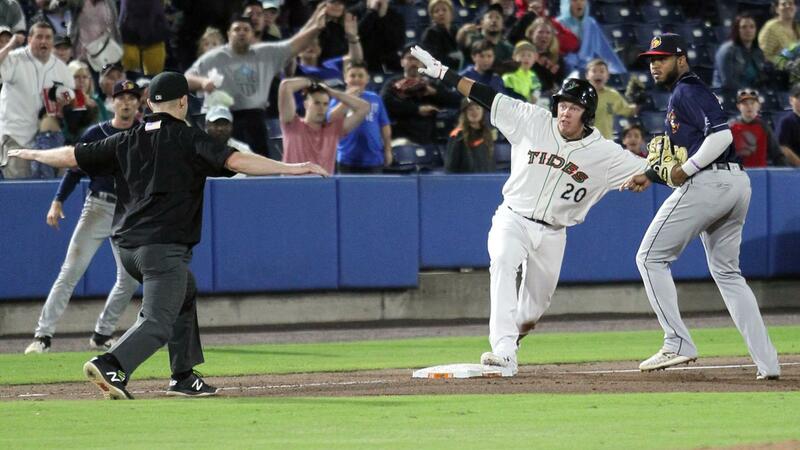 Norfolk rallied with three runs in the ninth inning and two more in the tenth frame, but the Toledo Mud Hens eventually outlasted the Tides 7-5 in eleven innings Thursday night at Harbor Park. The Tides trailed the contest 3-0 entering the ninth inning, but strung together a furious two-out rally to send the game to extras. Ryan Mouncastle put the Tides on the board with a two-out, two-run triple down the right field line, and Jace Peterson followed with a single up the middle to knot the game at 3-3. In the 10th, the Mud Hens plated a pair of runs to take a 5-3 lead, but Norfolk once again rallied to extend the game by a frame. Mason Williams brought the Tides within one run with an RBI double before coming around to score on a sacrifice fly by Jack Reinheimer to tie the game at 5-5. In the 11th frame, the Hens loaded the bases against Lucas Long (0-1) with nobody out, and Danny Woodrow followed with a two-run single to give Toledo the lead for good. Eduardo Paredes (1-0) kept the Tides off the board in the final frame, sending Norfolk to a loss in its home opener. Norfolk starter Luis Ortiz allowed two runs (one earned) on five hits over 4.0 innings of work, walking one and striking out four. He yielded a pair of runs in the opening frame before settling in, throwing 58 of his 80 pitches for strikes. The two clubs will continue their four-game set on Friday at Harbor Park, with Keegan Akin (0-0, 3.00) set to make his home debut. Toledo will counter with southpaw Matt Hill (0-0, 0.00), with first pitch slated for 7:05 pm. Tidebits: Prior to Thursday's game, the Orioles recalled LHP Tanner Scott from Norfolk and purchased the contract of RHP Josh Lucas from the Tides. OF Jaycob Brugman was placed on the Injured List, while IF Anderson Feliz and LHP Chris Lee were both promoted to Norfolk from Double-A Bowie… Norfolk committed two errors in the contest after entering the game with just one error over the first seven games of the season…RHP Jay Flaa made his Triple-A debut, allowing one unearned run over 3.0 innings of work…The announced crowd for the home opener was 7,515.